Three men have admitted deliberately hunting foxes in the east end of Glasgow. 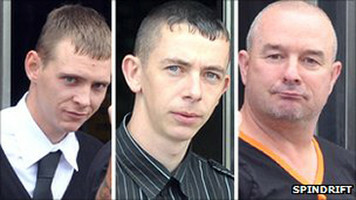 Samuel Burgoyne, 44, Robbie Lees, 26, and David Cassels, 24, used dogs with radio collars to hunt the animals on the Clyde Walkway in February. Glasgow Sheriff Court heard that the trio was caught by a wildlife crime officer who saw one of them holding a fox by the scruff of the neck. Sheriff Daniel Convery deferred sentence for good behaviour. The three men, all from Alexandria, Dunbartonshire, pleaded guilty to deliberately hunting foxes with four dogs on 25 February this year at the Clyde Walkway on London Road. The court was told the area of ground is a badger sett which has been used by hunters in the past and regular visits are made to ensure the safety of the animals. Depute fiscal Lorna Ferrier told the court wildlife officers have been carrying out surveillance of the area. She said: “Apparently badgers and foxes can co-reside in tunnels. “On this particular occasion it was 11.30am that a wildlife crime officer and a work experience student were making their way towards the area for the purpose of surveying a badgers sett. “As they approached they could see three males, at the sett there were dogs barking and they saw one of the males with a net. The court heard that the wildlife officer thought they might be digging for badgers so called the police. About half-an-hour later that wildlife officers and other police officers attended and heard dogs barking, and shouting. The three accused were told to raise their hands by an officer. Ms Ferrier said: “He saw the accused Samuel Burgoyne standing in a hole holding a fox by the scruff of its neck and the accused had a small black dog which had latched on to the fox. The dog went after the fox and snarling and yelping was heard. Police officers stopped Burgoyne as he tried to go after the dog and Lees and Cassels tried to move a net that was pinned to the ground when they saw the police. Three other dogs were also seen, two of which had radio collars on them and one had blood on its nose. Two metal spades, netting and three radio locaters were seized, as well as the four dogs. The court heard that two of the dogs were found with fox hair and fox DNA in their teeth. Roddy Boag, defending Burgoyne, said all three accused used their dogs to hunt rabbits and rats and that was their initial intention when they set out that day. He told the court that his client – who previously had dogs named Nipper, Bruiser and Asbo – had cared for dogs for years. Sheriff Daniel Convery said: “This was an organised, well equipped, joint expedition with nets, spades and dogs with radio collars. He also ordered that the dogs are re-homed and disqualified all three from owning dogs for two years.